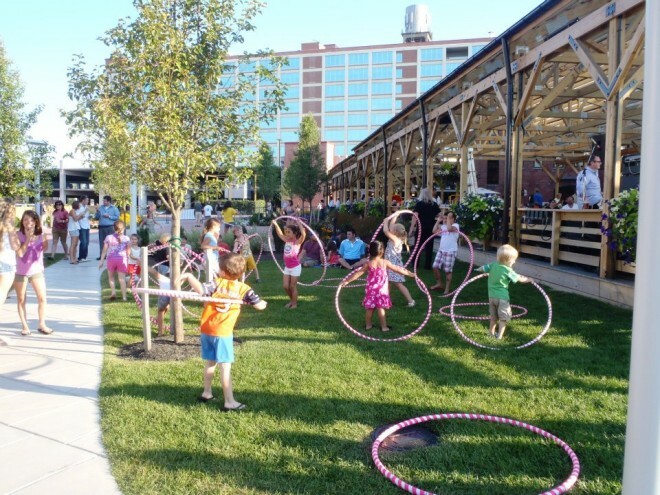 Larkin Square is a privately owned public space located near the heart of Buffalo, New York, owned and managed by Leslie - Director of Fun! - her husband Howard Zemsky, and their son Harry. What started out as a complex for the Larkin Soap Company (now long gone) has turned into a community center through mixed-use renovations and a town square that represents triangulation at its best. Through programming based on the principles of Placemaking, the Zemsky family has taken it upon themselves to create the kind of place they would want to spend time in - and share it with the entire city. We recently spoke with Leslie and her son Harry to learn more about this private development for the public good. Why did you create Larkin Square and how did it become what it is today? Leslie: The Larkin Terminal Warehouse building is a 600,000 square ft. building that has been converted into office space with a variety of companies and government offices located here including the corporate headquarters for First Niagara Bank. We have several law firms, an ad agency, foundations, homeland security, as well as public amenities such as day care, food service, shops, a hair salon, etc. - all in a 10 story building built in 1911. Upon acquiring the Larkin Terminal Warehouse, Larkin Development Group - where my husband is a Principal - continued to acquire land and smaller buildings in the surrounding Larkin District. We purchased the adjoining land in anticipation of parking and found that we didn't need it so much for that. Over the last 12 years, we’ve started to develop more sites and in 2012 opened Larkin Square, technically a private space. We started with a concert series that attracted 2,000 people, and went from there! We now have Food Truck Tuesdays, Live at Larkin Wednesday concerts, and the Larkin Square Author Series (and more). We are also planning a farmer's market for this summer and a new restaurant and beer garden to be opened by Harry across the street. To begin with, we loved how the square had all this great eclectic seating, architectural elements, the boardwalk. But we found the only time it was really crowded was during lunch for area office workers. So we got to thinking - it’s kind of a shame in the summer we have some of the nicest seating options available, there’s no reason not to come down and enjoy it for dinner too. We had a lunch restaurant but knew we didn't want to open that for dinner. We didn't have any feasible options for creating a dinner stop so food trucks were a natural solution to bring people down regularly. The concert series was an older demographic and the food trucks are capturing a younger demographic as well. It started with five food trucks and music, and just this Tuesday we had 26 vendors, live music, and 2,500 people show up. As a private developer, what motivates you to activate this space for the public? Leslie: We’re showing how you can work together to create a place even with a business model. In our private space we have a liquor license encompassing the entire space that the food trucks cover. Since it’s private, we’ve had people come from all over because they don’t have to pay a vending fee - even as far as Rochester! We own a restaurant in the square, and we embrace the food carts even as a business owner. It’s also great to partner with local businesses. It’s attracting other businesses to do the same thing - they’re building up as well and working with us to integrate into the area. The concert series brought people in an hour away. We can assume it might be similar for our food trucks. We even got an email from someone in Toronto who said oh my gosh, why don’t we have it there! We've really created a destination. 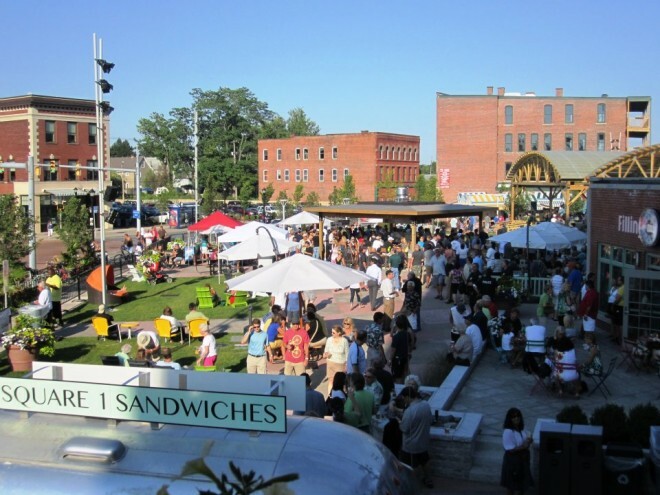 How did you first hear about Placemaking and what does it mean to you? Leslie: I didn't even know what Placemaking was! Steve Davies and I talked about the square we had, and he was really interested in the space and when he visited it he suggested that we take one of the PPS classes. Placemaking is having fun things to do, but feeling happy and uplifted. That’s what we’re doing with the streets and the shops and the buildings. It just feels so good when you’re there and you take a walk. It’s like an investment in good will - it includes a lot of things you wouldn't take out of the bottom line in your spreadsheet. Harry: In the hospitality business Placemaking is like setting a nice atmosphere and a good vibe, it has such an important and unique role. I think Placemaking is turning a place into a social environment around something - whether it’s a place you want to get a drink and be seen and people-watch, or just sitting in a square and you like being there. I think of it like in the hospitality world: you have your product and then you have your Placemaking. There’s an atmosphere element to it. It’s in the details. 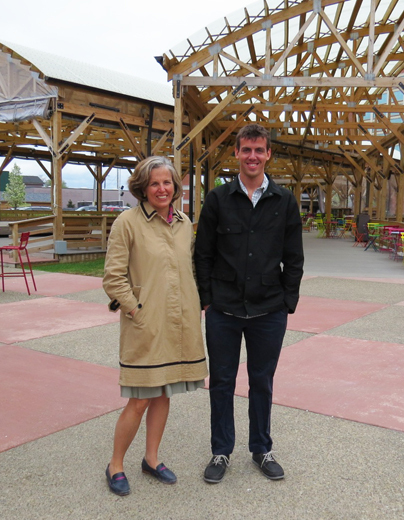 Your square is one of many exciting initiatives taking place in Buffalo right now. What do you see for the future of the city? Leslie: We are on fire right now - and we have to give credit where it’s due. We have an amazing Governor Cuomo who has made Buffalo a huge priority for economic aid. There is an initiative called the Buffalo Billion to build this up, especially in the downtown area. Our canal side area is really taking off with private development including a huge complex with a hotel and there are going to be new green energy companies coming to Buffalo because of the Buffalo Billion as well. People are really taking advantage of tax credits to come in and rehabilitate the warehouses that have been standing empty for a decade. The attitude of people has been changing too, and we've seen that in our events where people are coming back. We've lived here for 30 years and have always been really involved. Harry: I lived in Vermont for five years in college and even in that amount of time, coming back, I was like a new person in a new city because so much has happened. I've been approaching the city with a different attitude. The mindset when I was younger was “I’ll get out of here eventually.” Now the attitude is Buffalo is a great place to live in, there are great things going on. Buffalo is such a tight-knit community and it’s easy to be involved in so many different things. There are tons of kids around my age that are doing great things - urban planners and preservationists, etc. The younger cultural and art related community is coming out. And that’s what’s so fun about the food truck nights - it’s very multi-generational; there are high school kids, families, all eating dinner in the same public space. Leslie: The Congress for New Urbanism is holding their annual conference here in Buffalo this year. They'll be having an event here at Larkin Square where we'll be providing live music for them, some tours. We’ll have market stalls and everything set up for them as well. There will be a Placemaking component to the conference for sure. What advice do you have for other private developers looking to improve their spaces with Placemaking? Leslie: It might seem like you’re spending money that won’t go right to the bottom line, and you have partners and investments, but it’s not going to nothing. You have to invest to begin with to get it back. Not everyone can do what we do with the land we have. But yesterday for instance, I was at the library, which is by Lafayette square - completely empty. But if you took cafe tables and chairs and added food it would completely change the atmosphere. There’s no seating! So there's no reason to stay. Harry: I would think about ways to collaborate with other organizations and businesses who can partner and make a difference. There was an art initiative last summer with graffiti artists in the city where all these murals were done on the street in partnership with the business owners and now in this bar district you can walk around and see these local artists' work. Leslie: In the PPS classes there’s no better way to get ideas and connect with people in other cities for sure. The bottom line - take one of the workshops! It helps in a big way!